In India, there is the Standard Fire and Special Perils Policy, which is a named perils policy…. ‘fire’ is an insured peril …. Some of the other perils are : lightning, Explosion/Implosion; Aircraft Damage; Riot, Strike and Malicious Damage; Impact damage; Subsidence and Landslide including Rock slide – strangely, Fire policy also covers – wind and water perils – designated as : ‘Storm, Cyclone, Typhoon, Tempest, Hurricane, Tornado, Flood and Inundation’………….. the policy also provides for reimbursement of expenses up to 1% of the claim amount towards ‘debris removal’. 'Debris Removal’ provides reimbursement for clean-up costs associated with damage to a property. Policies with a debris removal provision typically only cover debris resulting from an insured peril, such as charred wood from a building fire. Read that this has evolved historically. The older policies of course made no mention of debris removal costs as either covered or excluded. ~ and most insurers routinely excluded any expenses so claimed, while some perhaps paid some portion. Those rejecting argued that this was a consequential, rather than a direct, result of the loss, and as such, was not covered. In Overseas at some point, a debris removal clause was added to the forms attached to the Standard Fire Policy. It simply stated that the coverage extended to include the cost of removal of the debris resulting from the property loss. The debris removal coverage was within, and did not increase, the limit of liability. The coverage was thus limited by the amount of insurance carried, so that in a substantial loss, the property loss plus the cost of debris removal might well exceed the amount of insurance but still the liability would not extend beyond the sum insured. A hedge or hedgerow is a line of closely spaced shrubs and tree species, planted and trained to form a barrier or to mark the boundary of an area. Hedges separate a road from adjoining fields or one field from another, and of sufficient age to incorporate larger trees, are known as hedgerows. It is also a simple form of topiary. Prosopis juliflora is a shrub or small tree in the Fabaceae family, a native to Mexico, South America and the Caribbean. It has become established as an invasive weed in Africa, Asia, Australia and elsewhere. The Leyland cypress, often referred to simply as leylandii, is a fast-growing coniferous evergreen tree much used in horticulture, primarily for hedges and screens. The plant's rapid growth (up to a metre per year) and great potential height – often over 20 metres (66 ft) tall, sometimes as high as 35 metres (115 ft) – can become a serious problem. In 2005 in the United Kingdom, an estimated 17,000 people were at loggerheads over high hedges, which led to violence and in at least one case murder. United Kingdom's Anti-Social Behaviour Act 2003, gave a way for people affected by high hedges (usually, but not necessarily, of leylandii) to ask their local authority to investigate complaints about the hedges, and gave the authorities in England and Wales power to have the hedges reduced in height. Reportedly there are 55 million leylandii in the UK and it is apprehended that soon it would become one for every person ~ there are thousands of disputes but they are still popular. 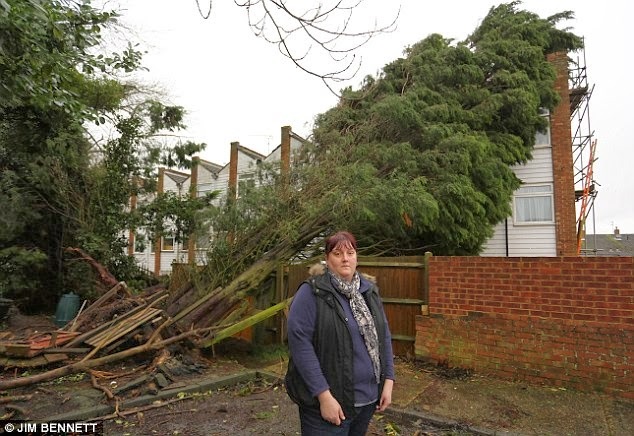 Here is an interesting case reported in Daily Mail – of a 50ft tree that crashed down on neighbour's flat on Christmas Eve at Kent. It is a scene that is all too familiar at the height of the recent storms. A tree felled by 60mph winds...while neighbours continued to argue over who is responsible for its costly removal. The 50ft leylandii, planted in a back garden, was already causing problems by overshadowing a next door flat in Walderslade, Kent. Then, on Christmas Eve, matters came to a head when it crashed down on the roof and rear wall of the neighbouring property – cutting off all the light from several windows and rendering its garden virtually impassable. Now Heidi Brett, who lives in the stricken flat, has been told that either she or her landlord, and not the owner of the garden in which the tree is still partly rooted, must pay £2,500 to have it removed. In the meantime, the giant leylandii has been left lying at a 40 degree angle against her block. The 35-year-old support worker was in her kitchen when she heard an enormous crash at the back door as the tree toppled. She said her landlord’s insurance firm had suggested he could pay the bill, which could then be claimed back from the leylandii owner’s insurance company. She added: ‘My landlord’s insurance company has said that he will foot the bill and they will try to reclaim it from the tree owner’s insurance firm. So the dispute is who pays for the cost ….. there is imperative need for the person affected to have it removed…. His landlord is not willing to pay though the landlord’s Insurers are willing to reimburse… there is stalemate. The person on rent feels that the innocent party is forced to clear up someone else’s mess. In law there is tort remedy and in Insurance – there is subrogation – where the recovery is to be made from the party responsible for the loss.